The House of the Opus Craticium is interesting because of its construction; the use of opus craticium. Cheap and quick to build, opus craticium consists of filling a brick and wood framework with a pebble and rock mixture known as opus incertum. 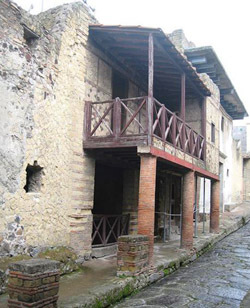 Numerous surviving examples of opus craticium have been found at Pompeii, but the parctice seems to have been particularly favoured at Herculaneum. The house was excavated between 1927 and 1933 by Amedeo Maiuri. The main structure of the house is supported by piers of opus incertum and brick, while curtain walls of opus craticium subdivide the interior. The house was divided into two small apartments. These units are better preserved under the layers of mud than the upper storeys of Pompeii, which collapsed under the weight of the lava fallout. The house's position in insula III reveals that in its original form it probably comprised a small atrium house.